It’s such an honor to have been asked to reveal the cover for Jackie Azúa Kramer’s upcoming picture book, That’s For Babies, coming out June 15. And it’s just so adorable! In addition, Jackie’s offering a special giveaway via Twitter. Please scroll down for more details. Prunella wakes up on the morning of her birthday and announces, “I’m a big kid now.” She doesn’t want to do any of the things she usually loves. “That’s for babies!” she announces over and over again. Even her favorite doll, Talking Sally, is abandoned. But what happens when a big kid gets scared during the night. A story about growing up, for little kids and big kids ages 4 and up. AN EXCLUSIVE INTERVIEW WITH PRU! Good Reads With Ronna: Prunella is a lovely name. Prunella: That’s for babies. My name is Pru. GRWR: I hear you celebrated your birthday! Prunella: That’s for babies. I’m five now. GRWR: Did you get lots of toys? Prunella: That’s for Babies. I’m a big girl now. GRWR: How about tea parties? Prunella: Hmm, nope. That’s for babies. GRWR: Are you excited for your book’s debut this June? Prunella: That’s for babies. But I do like story time! 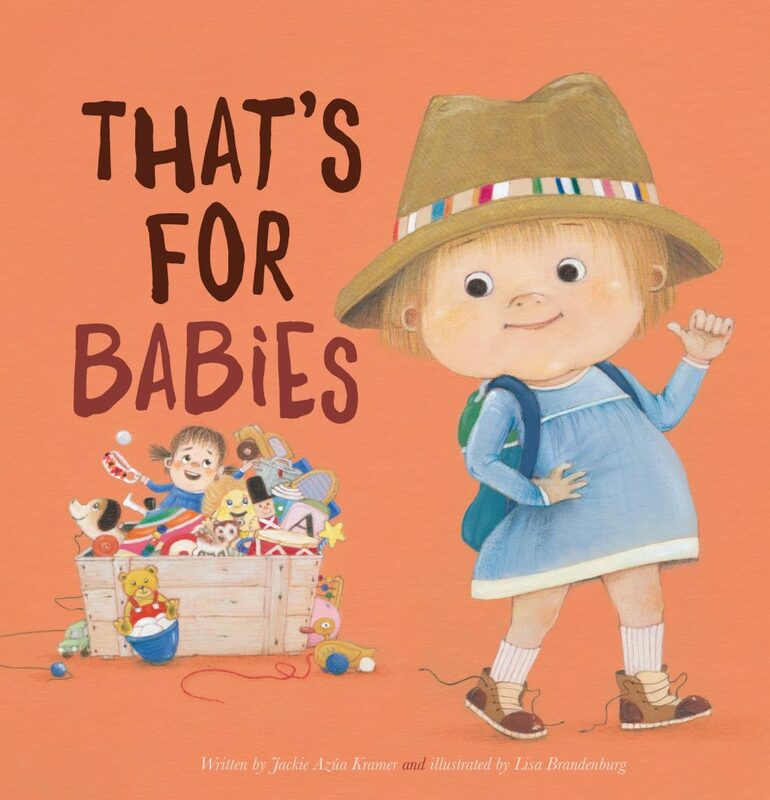 Visit and RT Jackie Azúa Kramer (@jackiekramer422) and GoodReadsWithRonna (@goodreadsronna) on Twitter for a chance to win a copy of That’s For Babies, but don’t wait because the giveaway opportunity ends at 12am on 2/16. U.S. only. Judy Moody is Back and Better Than Ever 13 Books Giveaway! AND WE WANT YOU TO WIN COPIES! FOR TWO SETS OF PRIZES. THEY’RE WILD! 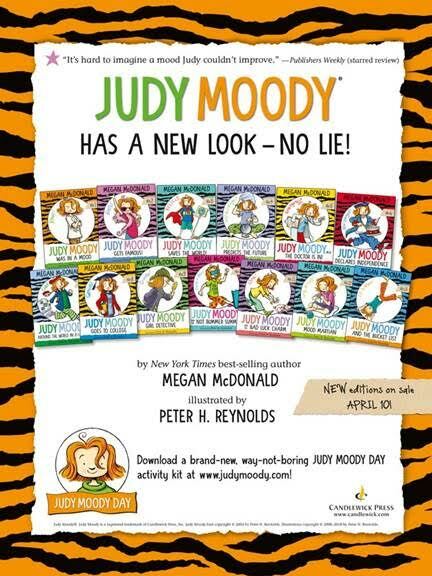 We’ve teamed up with Candlewick Press, publisher of the ever-popular Judy Moody books written by Megan McDonald and illustrated by Peter H. Reynolds, to celebrate the relaunch of all 13 titles in the series. Earlier this month Judy debuted a new look on her covers, likely inspired by her tiger-striped pajamas, all featuring attractive, bold colors plus a page of sassy Judy slang-style stickers. 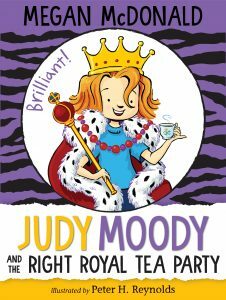 And, if that’s not exciting enough, book #14, the totally fab Judy Moody and The Right Royal Tea Party comes out in September and crikey, we cannot wait! Candlewick’s also updated the companion Judy Moody website so check it out here (www.judymoody.com) to stay in a Judy Moody state of mind. 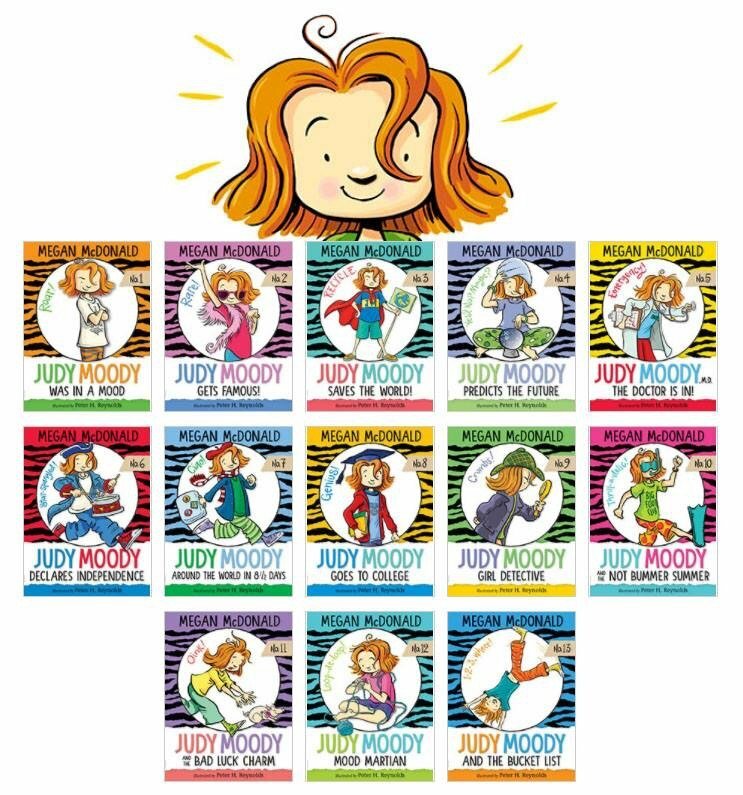 If you love Judy Moody like we do, pick up all of these majorly entertaining early chapter books, ideal for ages 6-9, at your local independent bookstore. It takes just one chapter to get hooked. That’s no surprise since Judy delights readers in more than 20 languages and her younger brother Stink does okay for himself, too. 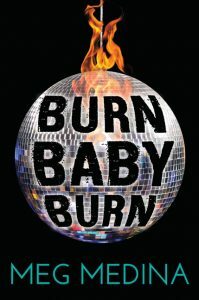 Read my interview with author Megan McDonald from a few years ago on the 10th anniversary of the Stink series of books by clicking here. McDonald shares so many awesome insights into Judy and Stink that you don’t want to miss it. What’s so special about Judy Moody? For starters, over 34 million copies of the Judy Moody books have been sold around the world! Also, this spunky third-grader has been around almost 20 years in Mr. Todd’s 3T classroom and still going strong, probably because her ever-changing moods and her spirited personality resonate with so many kids. She’s always getting up to something so “not-boring” that it’s hard to resist turning the pages to find out what will ensue, where, and with whom. From frenemy Jessica Finch and little bro and “scene-stealer” Stink, to pals Rocky and Frank, Mr. Todd, Mom, Dad, Grandma Lou, Toady and cat Mouse (to name just a few), the fully realized and engaging cast of characters makes for some hilarious and always surprising reading. Perfectly unpredictable and not one to sit still or sit out when an adventure’s around the corner, Judy offers convincing clues in her book titles for a good idea of what antics she’ll get involved in. And it’s easy to root for her happy endings. Every book is packed with interesting back matter whether that’s fun factoids, interviews and timelines not to mention Judy Moody’s Not-Webster’s New World College Dictionary, First Edition and SO much more. 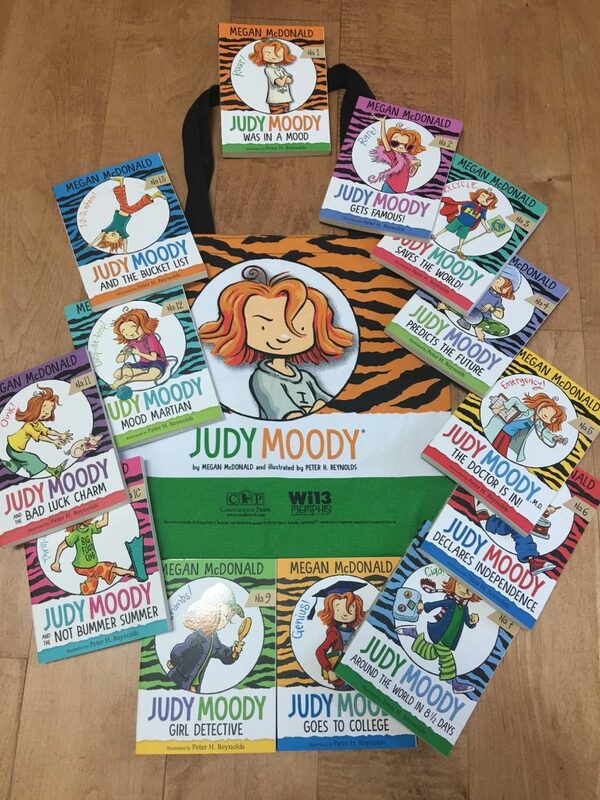 Win all 13 of the definitely cool new look Judy Moody books along with a totally awesome tote to carry them in courtesy of Candlewick Press! GIVEAWAY: One Good Reads With Ronna reader will win an entire collection of the way-not-boring Judy Moody titles (1-13) and the awesome sauce, specially designed Judy Moody tote bag as seen in the above photo (MSRP $77.87 and free promotional tote.) A runner-up will receive the first three most definitely not-boring books to try out (MSRP @ $17.97). Entrants must be from the US and Canada (no PO Boxes please). All prizes will be mailed from the publisher. Just in case you are not familiar with all the books, below is a comprehensive list. Please note that Book #14 is not included in the giveaway. This giveaway ends at midnight PDT on Tuesday, May 8, so Monday May 7 is the last full day to enter. No lie! Scroll down now for the Rafflecopter and good luck! 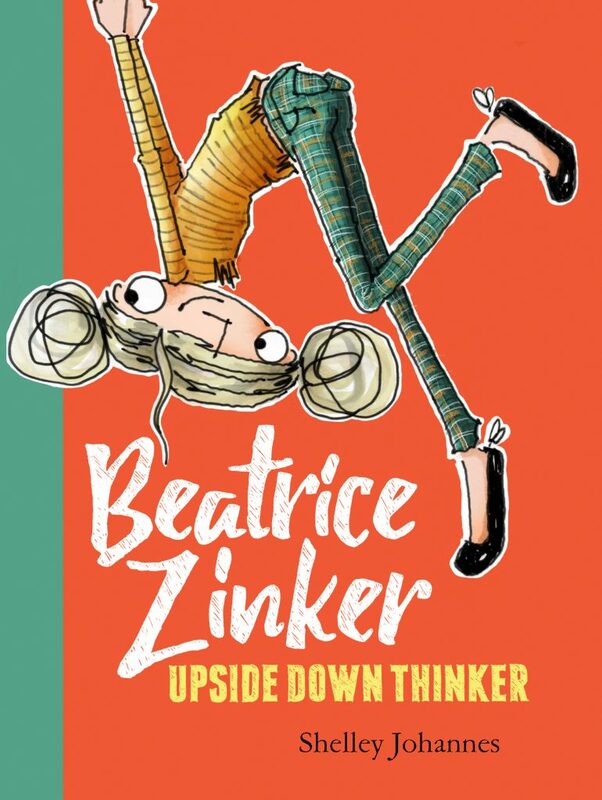 Beatrice Zinker, Upside Down Thinker – A Giveaway Courtesy of Disney-Hyperion! and we’re delighted they’re partnering with us for the giveaway! Read the review then scroll down to enter the giveaway today! In Shelley Johannes’s charming debut, Beatrice Zinker, Upside Down Thinker, the main character is appealing in a cute and quirky way. She’s someone whose personality will no doubt resonate with many different thinkers when they see themselves reflected on the pages of this delightful new chapter book series for tweens and pretweens. Beatrice approaches life from a creative and different perspective. In other words, she does her best thinking upside down. Up until third grade, this singular skill has been accepted, even rewarded by her school teachers. But things are about to change as the summer of second grade ends and it’s time to head back to school. Not one to make promises easily unless it’s very important (a running sight gag throughout this illustrated story), and involves her BFF Lenny Santos, Beatrice is dressed and ready for third grade in her ninja attire as was agreed upon when second grade ended. The outfits signified the girls’ participation in a secret plan called Operation Upside that was supposed to be put into action on day one. Then why does Lenny, unrecognizable in pink instead of her brother’s black hand-me-downs, seem to have forgotten? Maybe her new friend and neighbor Chloe has something to do with it and that’s why they’ve also chosen desks right next to each other! Beatrice, on the other hand, has to sit up front, under the watchful eyes of the strict Mrs. Tamarack. Beatrice is determined to find a way to convince Lenny to reconsider the mission when it’s obvious that, with Chloe now in the picture, the stealth operation has been put on hold. Being an upside down thinker, Beatrice develops an unusual and risky plan that winds up including a dangerous fall and a clandestine visit to the staff room, something no ordinary student could ever concoct. Will Beatrice win back her friend and give Operation Upside a reboot? It seems there’s a lot at stake for this thoughtful third grader whose resilience is demonstrated in the most original ways, and who is certain to inspire young readers rooting for her success. Johannes does a terrific job of engaging readers right from The Very Beginning, the title of Chapter One. Young Beatrice is hanging onto a branch in the first of many marvelous illustrations “created with felt-tip pen, brush marker, and colored pencil on tracing paper,” and using only black, grays and orange. And it works wonderfully. There’s occasional rhyme and an easy flow from chapter to chapter in this 155-page book kids should breeze through. The problem-solving and different thinker theme is age appropriate and should encourage interesting conversations about creativity, inclusiveness and friendship. The 20 chapters are short and Johannes makes sure there are no loose ends which can sure get in the way if you’re an upside down thinker! I’m eager to see what this amiable tween who marches to her own drummer gets up to in Book#2. Beatrice does her best thinking upside down. 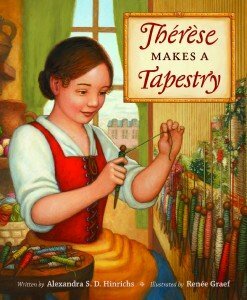 Can Beatrice use her topsy-turvy way of thinking to save the mission, mend their friendship, and flip things sunny-side up? she’s written. Find her online at shelleyjohannes.com. Be An Upside Down Thinker! And branded pencil case and notepad! for your chance to win a copy and cool BZUDT swag! Click’d by Tamara Ireland Stone – A Giveaway Courtesy of Disney-Hyperion! How exciting to be participating in this cool Click’d giveaway! on this great giveaway opportunity for readers! Scroll down to get the lowdown! Visit the Official Click’d Site here. Like Disney Books on Facebook. HERE’S AN EXCERPT TO GET YOU PSYCHED! 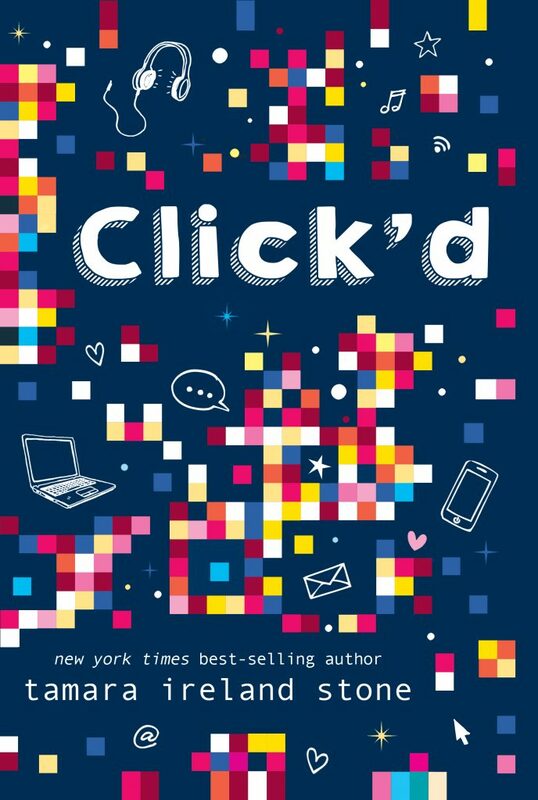 Read an excerpt from Click’d here. Get ready to see how Click’d will click with you. coding, and lots of popcorn in her fun and empowering middle-grade debut. Watching her app go viral is amazing. Leaderboards are filling up! and Time After Time, and the New York Times best seller Every Last Word. with her husband and two children. She lives in the San Francisco Bay Area. Please note that this Giveaway is open to US addresses only. The Rafflecopter giveaway will end on 10/11/17 at 12:00a.m. PST. If you’re not a winner, you can find this fab book for $16.99 at your local independent bookseller. We know you’re going to love getting Click’d!! We’re delighted to be included in Peachtree Publishers’ Blog Tour for Alison Hart’s Leo, Dog of the Sea, the fourth installment in this action-packed series available April l. The Dog Chronicles series introduces young readers to the important yet often overlooked roles our canine companions played in major historical events. Please read on for more info about the book and giveaway. 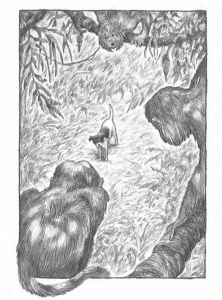 Interior illustrations from LEO, DOG OF THE SEA by Alison Hart copyright © 2017 by Michael G. Montgomery. Used with permission from Peachtree Publishers. After reading the first few pages of Leo, Dog of the Sea, prepare to be instantly swept aboard the Trinidad, one of five ships in the Spanish armada under the command of Captain General, Ferdinand Magellan. The date: August 1519. In 14 fast-paced, engaging chapters, readers will join the ship’s rat-catching canine, Leo, who narrates the treacherous voyage around the globe as Magellan navigates the seas looking for a route to the Spice Islands. They’ll also meet a motley crew and a colorful cast of characters and can decide for themselves who is worthy of friendship and loyalty and who is not to be trusted. While Leo certainly becomes the most endearing of the lot, Pigafetta, Magellan’s Italian scribe, and Marco, a young stowaway are sure to be favorites, too. Hart has once again created an observant and compelling character, this time in Leo, a dog reluctant to get close to any human. Now embarking on his fourth voyage to foreign lands, Leo has a wealth of seafaring experience making his detailed descriptions of all things sailing related both realistic and believable. And while five vessels set out in search of a westward route, only one will complete the entire three year journey intact. When the armada sets off, readers learn that reporting directing to Magellan is master-at-arms, Gonzalo Gomez de Espinosa who will, according to Magellan, “… carry out my orders and assure that the laws of Spain and navigation are obeyed.” This man is the epitome of cruel and Leo and Marco must steer clear of him to save their skins. 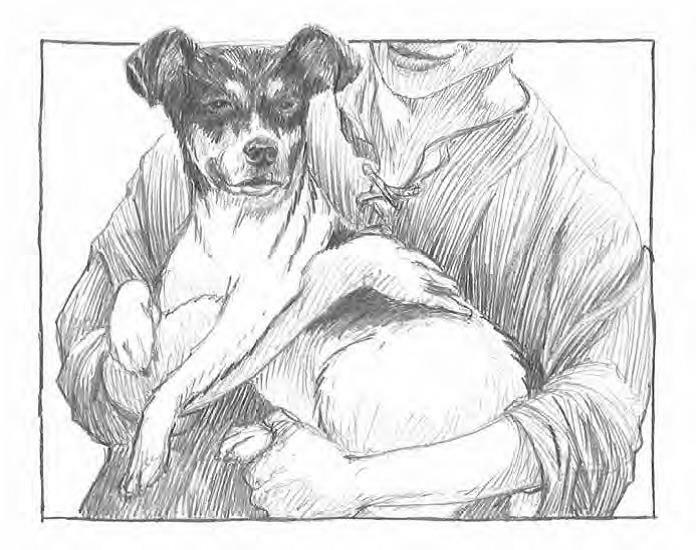 Keeping notes on everything that occurs, good and bad, is Pigafetta who takes to the boy and dog early on, helping them survive during the perilous trip. It doesn’t hurt that Leo displays bravery in the face of adversary on numerous occasions. And Marco, stoic and astute, proves to be an invaluable companion and page. The story revolves around all the various ports of call visited, the inhabitants encountered and the obstacles faced by Magellan and his crew along the way. Those include every type of weather condition imaginable including violent storms or lack thereof, thievery, hunger, deadly disease, mutiny and murder. I knew little about Magellan before beginning the book and found myself eager to find out more as I approached the story’s end. Fortunately there are 19 pages of information Hart has included to fill interested readers in on the rest of what happens after her story finishes as well as other fascinating facts about seafaring in the 16th century. From ship dogs to conditions onboard, the back matter in Leo, Dog of the Sea is as riveting and educational as the rest of the book. 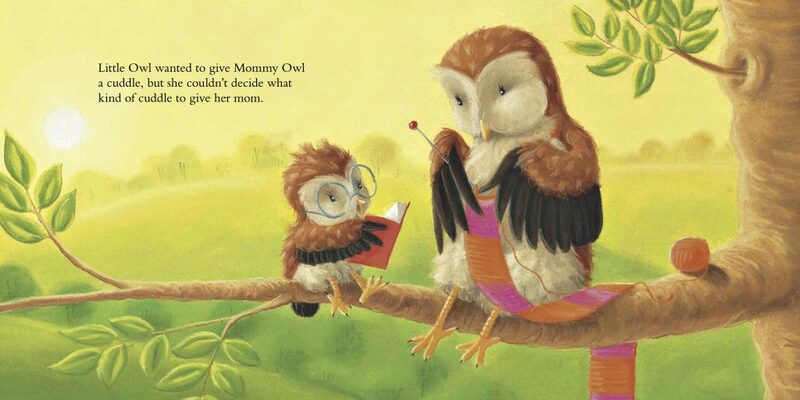 Illustrator Michael G. Montgomery’s artwork adds to the book’s appeal. 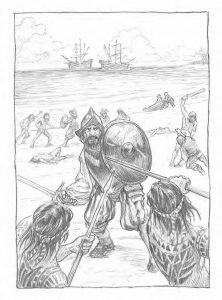 His pencil illustrations provide just enough detail to give readers a real taste of the clothing and equipment of the time period, while zeroing in on the key action of a chapter. I guess in closing I have to say that, unlike days out a sea for Magellan’s armada, with no wind blowing for weeks on end, this middle grade historical fiction chapter book is never, ever boring. Get a copy today at your local independent bookseller or enter our great giveaway below. Thanks for stopping by the blog tour. Here are more blog posts to check out, too! Other books in this series: Darling, Mercy Dog of World War I; Murphy, Gold Rush Dog; Finder, Coal Mine Dog. Please read our review of Darling, Mercy Dog of World War I, Book One in the Dog Chronicles series by clicking here. Click here for a Teacher’s Guide. Click here to read a Q & A with author, Alison Hart. 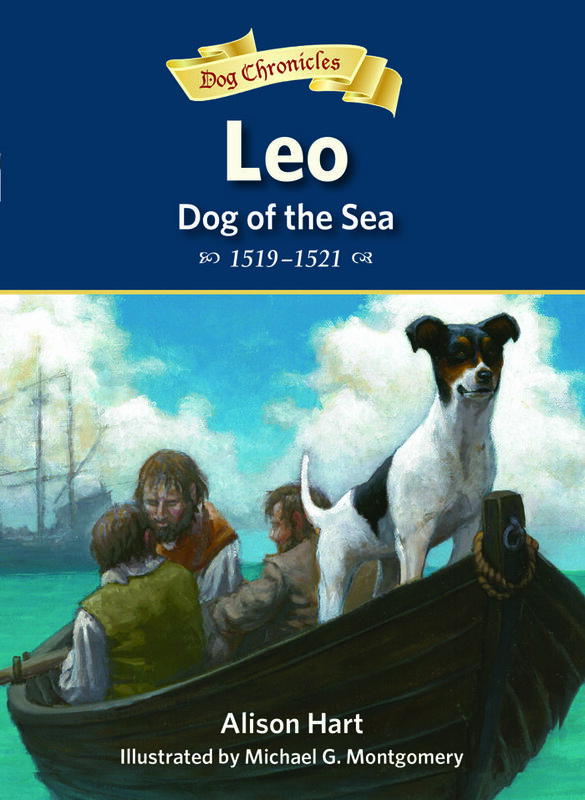 Please leave a comment on this blog post for your chance to win one (1) copy of Leo, Dog of the Sea, courtesy of Peachtree Publishers, MSRP value $12.95. One or two words for comment will not be considered valid entries. Giveaway ends 11:59p.m. on April 18. The winner will be chosen via Random.org on April 19th. For an extra chance to win, follow Good Reads With Ronna on Facebook here and let us know you did. Want to increase your chances? Get an additional entry into the giveaway by following this blog on Twitter or tweeting about the giveaway. Must be U.S. resident to enter. The winner will be notified via email. Good luck! REVIEW: When I read Patricia Hruby Powell’s Loving vs. Virginia I felt like a fly on the wall or a Jeter family cousin, as the action of this powerful story unfolded around me. Despite knowing how things turn out in the end, I found every aspect of this teen docu-novel incredibly riveting and eye-opening. Through meticulous research and interviews, Powell has successfully managed to transport readers back in time to the Jim Crow south of Caroline County, Virginia. Plunked down into the small neighborly community of Central Point, we’re quickly swept up into the lives of sixth grader Mildred Jeter, and her close knit family. The year, 1955. 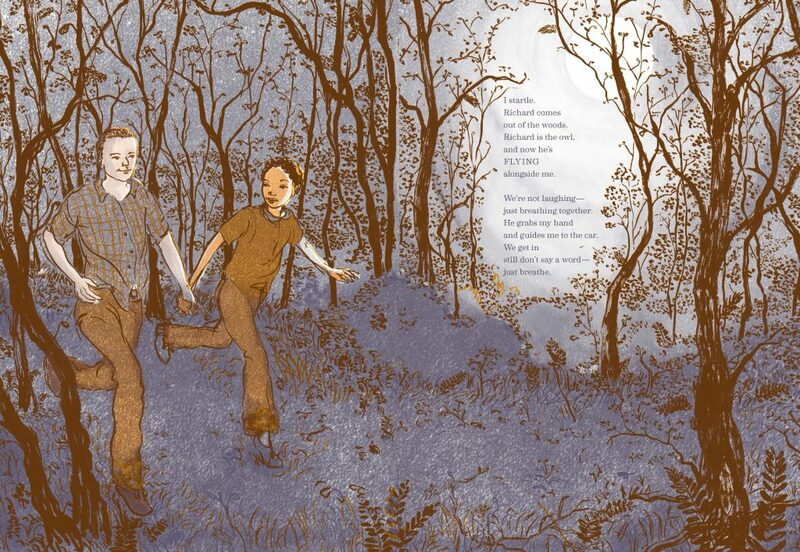 Interior artwork from Loving vs. Virginia by Patricia Hruby Powell with illustrations by Shadra Strickland, Chronicle Books ©2017. As the romance between family friend Richard Loving and Mildred Jeter developed and grew, so did their problems. Strict segregation laws banning interracial marriage were in effect in over 20 states making any romantic relationship between a black woman and a white man a crime, and vice versa. Virginia, the state that Mildred and Richard called home, made no secret of its distaste for interracial marriage and did whatever it could to thwart these relationships. Mildred often noted that had their genders been reversed making Mildred a white woman and Richard a black man, he’d have surely been hung. So while things were already difficult for these two, matters were made worse by the local law enforcement. A nasty man named Sheriff Brooks was determined to keep the lovers apart or make them pay. When Mildred and Richard eventually got married in D.C. where it was legal to do so, they returned home to Central Point intending to stay under the radar. But secrets were hard to keep in small towns and it wasn’t long before Sheriff Brooks invaded their home as the legally married couple slept together. The marriage was not considered legal in Virginia and the Lovings were guilty of committing a crime. Mildred and Richard were arrested! Having not seen the film or read anything about the Lovings, I was shocked by this dead of night intrusion. This would only be the first of several arrests that eventually led Mildred and Richard to young lawyers with the National Civil Liberties Union. The Loving’s rights as Americans, according to their plucky attorneys, were being denied. It took several years and a lot of personal sacrifice for the couple, but they worked through every issue, and their compelling case was ultimately heard by the U.S. Supreme Court. Of course as we all know, they won in a unanimous decision under Chief Justice Earl Warren, but the fear of losing was palpable. It was no longer illegal to marry someone of another race. And at last, the Mildred and Richard could raise their children in their home state of Virginia without fear of breaking the law. Perseverance, fearlessness, and commitment helped this couple make history. The year, 1967. And now in 2017 we can proudly mark the 50th anniversary of this important case and the Lovings that made it happen. Powell’s writing is at once simple yet sophisticated. The ample white space of each unillustrated page invites readers in slowly and calmly as the tension of the story builds. Told in blank verse, Powell’s narratives alternate between the distinct voices of Mildred Jeter and Richard Loving, bringing enlightening perspectives to teen readers. The text is complemented by illustrator Shadra Strickland’s evocative artwork done in visual journalism style “characterized by a loose, impromptu drawing style” containing overlapping lines and “an informal feeling of sketches in the final composition.” Strickland’s illustrations made it easy to picture the setting, the characters, the time period and the events. I cannot imagine this story with any other type of art. Its minimal and muted color palette and its interspersing of historical photos in black and white worked wonderfully to convey the mood of this era. Helpful information can be garnered from the extensive resources included in the back matter of this book such as a time line, a bibliography, quote sources and moving messages from the artist and author. 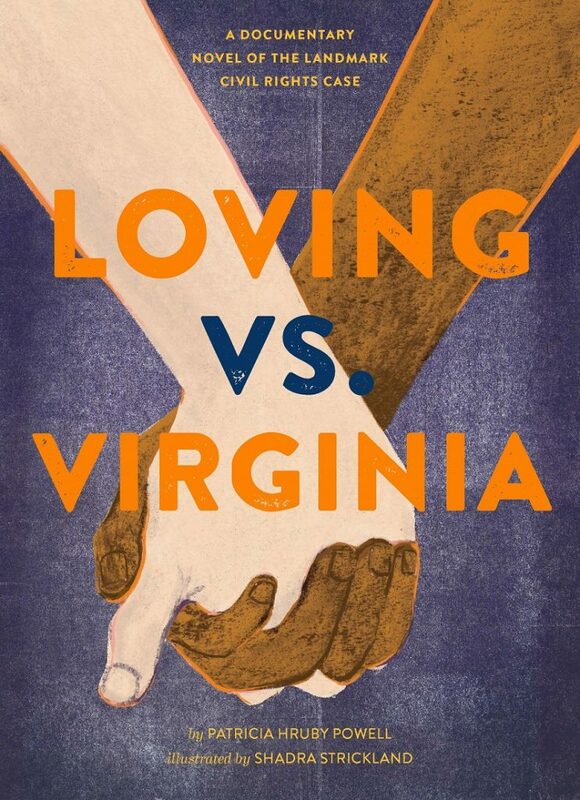 With its still timely message of civil rights, equality and racial tolerance, Loving vs. Virginia should be required reading for every high school student. I will be recommending it to everyone I know with a teen at home. 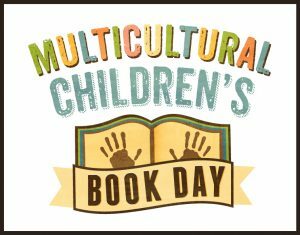 Multicultural Children’s Book Day 2017 (1/27/17) is its fourth year and was founded by Valarie Budayr from Jump Into A Book and Mia Wenjen from PragmaticMom. Our mission is to raise awareness on the ongoing need to include kid’s books that celebrate diversity in home and school bookshelves while also working diligently to get more of these types of books into the hands of young readers, parents and educators. Despite census data that shows 37% of the US population consists of people of color, only 10% of children’s books published have diversity content. 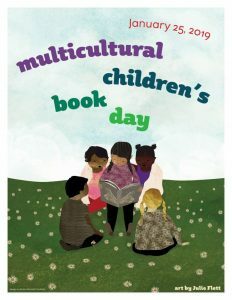 Using the Multicultural Children’s Book Day holiday, the MCBD Team are on a mission to change all of that. MCBD 2017 is honored to have some amazing Sponsors on board. Platinum Sponsors include Scholastic, Barefoot Books and Broccoli. Other Medallion Level Sponsors include heavy-hitters like Author Carole P. Roman, Audrey Press, Candlewick Press, Fathers Incorporated, KidLitTV, Capstone Young Readers, ChildsPlayUsa, Author Gayle Swift, Wisdom Tales Press, Lee& Low Books, The Pack-n-Go Girls, Live Oak Media, Author Charlotte Riggle, Chronicle Books and Pomelo Books. Author Sponsors include: Karen Leggett Abouraya, Veronica Appleton, Susan Bernardo, Kathleen Burkinshaw, Maria Dismondy, D.G. Driver, Geoff Griffin, Savannah Hendricks, Stephen Hodges, Carmen Bernier-Grand, Vahid Imani, Gwen Jackson, Hena, Kahn, David Kelly, Mariana Llanos, Natasha Moulton-Levy, Teddy O’Malley, Stacy McAnulty, Cerece Murphy, Miranda Paul, Annette Pimentel, Greg Ransom, Sandra Richards, Elsa Takaoka, Graciela Tiscareño-Sato, Sarah Stevenson, Monica Mathis-Stowe, SmartChoiceNation, Andrea Y. Wang. 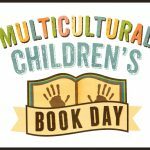 Free Multicultural Books for Teachers here. 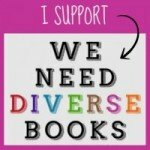 Free Diversity Book Lists and Activities for Teachers and Parents here. Get a FREE Kindness Classroom Kit here. The MCBD ebook is LIVE on Amazon here!! This ebook will be FREE to everyone January 26th-January 30th. For people who have KindleUnlimited it’s free for them all of the time. Hashtag: Don’t forget to connect with us on social media and be sure and look for/use their official hashtag #ReadYourWorld. Patricia Hruby Powell’s previous book, Josephine: The Dazzling Life of Josephine Baker, won a Sibert Honor for Nonfiction, a Coretta Scott King Honor, and five starred reviews. She lives in Illinois. Shadra Strickland is an illustrator whose work has won an Ezra Jack Keats Award, a Coretta Scott King/John Steptoe Award for New Talent, and an NAACP Image Award. She lives in Maryland. Details of our giveaway courtesy of Chronicle Books are below. Plus, if you follow us on Facebook and let us know that you did by telling us in the comments of this blog post, we’ll give you an extra entry. An additional comment on our Facebook page post for this book review gets you yet another entry. Also, if you enjoyed this review, please subscribe to our blog. Thanks and good luck! While violence runs rampant throughout New York, a teenage girl faces danger within her own home in Meg Medina’s riveting coming-of-age novel. Maggie Thrash has spent basically every summer of her fifteen-year-old life at the one-hundred-year-old Camp Bellflower for Girls, set deep in the heart of Appalachia. She’s from Atlanta, she’s never kissed a guy, she’s into Backstreet Boys in a really deep way, and her long summer days are full of a pleasant, peaceful nothing . . . until one confounding moment. A split-second of innocent physical contact pulls Maggie into a gut-twisting love for an older, wiser, and most surprising of all (at least to Maggie), female counselor named Erin. 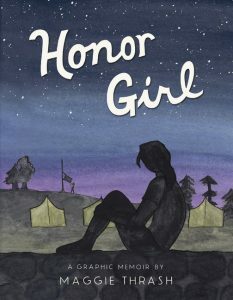 But Camp Bellflower is an impossible place for a girl to fall in love with another girl, and Maggie’s savant-like proficiency at the camp’s rifle range is the only thing keeping her heart from exploding. When it seems as if Erin maybe feels the same way about Maggie, it’s too much for both Maggie and Camp Bellflower to handle, let alone to understand. All-girl camp. First love. First heartbreak. At once romantic and devastating, brutally honest and full of humor, this graphic-novel memoir is a debut of the rarest sort. While everyone was out at the pool during my Florida vacation this winter, I remained indoors because I could not put down this multiple award-winning novel from Newbery Medalist Schlitz. 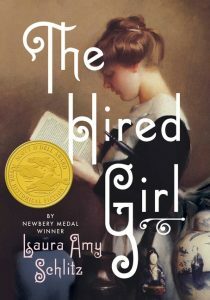 I relished being brought back in time to 1911 Baltimore following the ups and downs of protagonist Joan Skraggs as she becomes the hired girl in a wealthy Jewish household and tries to find her place in the world. Fans of historical fiction should add this to their must-read list. 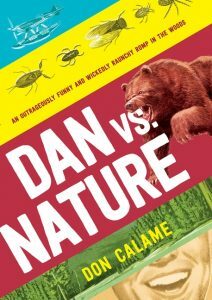 Novelist and screenwriter Don Calame, has penned a fast-paced, fun YA novel for the most reluctant of teen readers. If you’re not sure what’s in store, better check out Calame’s clever book trailer here because it really gives you a good taste of the author’s unique sense of humor. High schoolers will appreciate the predicament that the main character, Dan Weekes is thrown into, survive being with his future step-dad or survive the wild. Shy and scrawny Dan Weekes spends his time creating graphic novels inspired by his dream girl and looking out for his mom as she dates every man in the state of California. Then his mom drops a bomb: she and her latest beau, Hank, are engaged, and she’s sending her “two favorite men” on a survivalist camping trip to “bond.” Determined to trick Hank into showing his true — flawed — colors on the trip, Dan and his nerdy germaphobe best friend, Charlie, prepare a series of increasingly gross and embarrassing pranks. But the boys hadn’t counted on a hot girl joining their trip or on getting separated from their wilderness guide—not to mention the humiliating injuries Dan suffers in the course of terrorizing his stepdad-to-be. With a man-hungry bear on their trail, no supplies, and a lot of unpleasant itching going on, can Dan see his plan through now that his very survival depends on Hank? From screenwriter Don Calame comes another outrageously funny and raunchy tale of teen boys whose plans go awry — this time, on a survivalist camping trip. ENTER OUR GIVEAWAY NOW – Increase your chances of winning. You’ll receive an extra entry for following Good Reads With Ronna on Facebook, but please let us know you’ve followed by telling us when you comment below. Thanks and good luck! Fans of The Wig in the Window eagerly awaited the arrival of its companion book, The Tiara on the Terrace, and were rewarded this past January with its release. But even if you’ve never read Kittscher’s first book, her latest, The Tiara on the Terrace, can most certainly be read as a stand alone and is terrifically entertaining and awash in the adventures of Young and Yang. Good Reads With Ronna: Are detective stories what you read growing up? 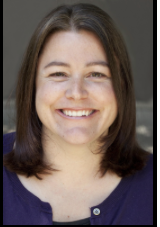 Kristen Kittscher: I was a voracious reader. I read all kinds of things so detective stories weren’t the only things I read but they were some of my favorites. I was a big big Nancy Drew and Hardy Boys fan as I’m sure many people are. I love Encyclopedia Brown. I just loved solving the puzzles that were involved. One of my very favorite books as a kid was From the Mixed Up Files of Mrs. Basil E. Frankweiler and that kind of mystery [where] they’re locked in a museum. I always loved solving puzzles but really I read widely. Judy Blume was an absolute favorite of mine. I think Blubber was a one of my all-time favorite books growing up. And Cynthia Voigt’s Homecoming was another book I loved. GRWR: Empowerment is prevalent in both novels. Was this a goal of yours? KK: It’s interesting. After the book was out in the world I’d hear that a lot and it wasn’t an actual focus of mine when I was writing … I think it’s because I taught at an all-girls school many years and I was swimming in girl power without realizing it. I was teaching 7th grade where girls are starting to become more self-conscious. But at that school they were very much themselves and not worried about how they were coming across. And I think I was definitely trying to write a story for them and was very influenced by their joie-de vivre and general sense of fun and curiosity and smarts as I was writing. I didn’t think about it. It just came out that way. GRWR: What qualities do Sophie, Grace and their quirky pal, Trista have in common with you? KK: Well maybe I’ve given them qualities I don’t have because that’s the fun of writing fiction, right? I’m definitely very curious myself and always loved a sense of intrigue. I’m pretty silly and they’re pretty silly. I think in a way they probably have more attributes of my students but Trista’s practicality and her kind of ability to just sort of, kind of plug on no matter what. I definitely have a bit of that as well. She’s a bit like my father was and I’m a bit like him so I always think I definitely have a little bit of Trista in me. The other quality definitely is the lack of confidence that Sophie has in coming into her own. I just started writing late in life – this is the first thing I ever wrote – or ever finished – and I really was focused on teaching and not writing. So, the thought of saying I want to be a writer is like saying I want to become a rock star or something like that. The story of The Wig in the Window is a mystery but it’s also kind of paralleling my journey in finding my voice as a writer. GRWR: Getting into the heads of two twelve year olds isn’t easy. What helped you? KK: Well, it helps to kind of be 12 in my head mostly! Well I think it goes back to my teaching middle school for a long time. I can’t remember what I was like before I was teaching 7th grade, whether I was also still 12 or if they helped me get back in touch with my youthful self. But definitely having that be my world day in and day out for a long time definitely rubbed off on me. As to Sophie and Grace, their perspective was relatively easy for me to access. The other part that makes it easy for me is having moved a lot as a kid. I moved almost every two years when I was growing up. So each place at each age I was, I remember it really vividly. I’s a very separate point in time and it’s relatively easy for me to go back to a certain place geographically in my mind and get back in touch with the feelings I had at that time. So it was a blessing in a way having moved so much because then I can remember each place individually. GRWR: Where were you at age 12? KK: At age 12, I was in the South Bay so basically Torrance, Palos Verdes area. For those people who don’t know, it’s this beautiful peninsula at the bottom of Los Angeles. It’s one of the most beautiful places I ever lived. You’re right by the beach. I think at the time as a kid you don’t realize how beautiful it is so when I set out to write something that came back to me very much and I knew it would be a fun setting for other people to read about too. GRWR: Was there any pushback from the Tournament of Roses organization to change the similarities? KK: No. But definitely the fictional town of Luna Vista is a combination between Pasadena and the place I just described, Palos Verdes and Torrance area. It’s my observing my students here in Pasadena and my own memories back when I was 12. And the town of Luna Vista has AmStar (which is very similar to the Jet Propulsion Laboratory) so we have a great deal of scientists, actual rocket scientists as Pasadena does, and that makes it lots of fun to explore lots of technological things. That’s where the idea of Trista having such technological savvy comes from but as far as pushback from the tournament, no. One of my former students was on the royal court and she sat down with me and told me all about her experience as a princess so I actually had a lot of cooperation. Other former students told me about the audition process, other colleagues, longtime Pasadena volunteers and parade goers definitely helped me with all of their memories and observations. And then when the book was finished the Tournament House was considering even doing a launch there as well. Unfortunately the launch of the book came three days after the Rose Parade itself. So I don’t know if their lack of cooperation after the fact had more to do with the fact that they were focusing on their event because, as you know, it’s a huge operation and requires thousands of volunteers and all kinds of things. I haven’t experienced any direct pushback, but there is of course some gentle fun that I’m poking at the parade so we’ll see. GRWR: How did you know the Wrigley Mansion so well? KK: Well, for those who don’t know there’s a mansion in Pasadena called the Wrigley Mansion, which is the tournament headquarters and it was donated by Mr. Wrigley, the chewing gum magnate you all know so well. So I thought it would be fun to create this sort of parallel world where Mr. Ridley who is a root beer magnate has his whole thing because basically I wanted a literal root beer float in the parade. Right? That makes it much more fun. I definitely had that outside of the mansion in my head as I was writing. Also you can take tours of the mansion and while it’s been renovated into offices, some of the rooms I definitely had in mind as I was writing so maybe that helped add a little flair to the setting. GRWR: What else did you do for research? KK: I was also an embedded undercover agent in float decorating. Every year in Pasadena before the parade begins, students pour out to volunteer in what are called the Float Barns which are these huge warehouses where the floats are. Actually before ever writing the story the inspiration where it comes from is my volunteering as a float decorator on the Trader Joe’s float one year. I was there gluing on flowers and climbing around on scaffolding so in the opening of the novel, Sophie, the main character, nearly falls from the scaffolding. Well that’s directly related to my own fear of heights crawling around on the scaffolding which I thought was highly unsafe for a 12-year-old. I also would constantly be Googling and referring back to different news articles just to get more inspiration and details. I don’t know a lot about flowers and obviously flowers are a very important part of the float decorations. So all the different kinds of things that are used to create different colors I would constantly be having to check back on, and say oh they used cinnamon for the brown part. I only knew what my tasks were as the decorator. I didn’t know what other flowers are used and I’m sure I messed it all up. GRWR: Do they use a lot of different flowers? KK: Oh, no they’re endless- I mean that’s part of their creativity – every single bit of surface area of a float needs to be decorated with some sort of living material. Even the tires of the float – they’re black, right? But we need to keep them black so they cover the tires with sheets of sea weed. Those little squares of seaweed that you got – that is really what they do. In order to win any of the prizes everything needs to be organic material of some kind. GRWR: And there are people underneath the float? KK: Yes, a major plot point of The Tiara in the Terrace is Trista working on a driver-less float because she finds that it would revolutionize the festival not to have people in these cramped compartments. One of the other things that is also very true about the parade is the need for what they call the pooper scooper brigade of kid volunteers who shovel up after the horses. The reason for that isn’t just to keep the parade route clear it’s because if they don’t clean up after the horses the wheels of the float kick up the remains of the horse poop into the eyes of the float drivers and gets in the ventilation system of their float. We’re getting right down to the nitty gritty. GRWR: Because The Tiara on the Terrace is for middle grade students and includes murder, did you have to diffuse it with humor? How do you go about bringing that into a story? KK: It’s true. It’s pretty hard to write a murder mystery for kids. You have to make it silly in some cases, but you know that kids also love the stakes being potentially high or real. In this case, you have what’s a potential murder. All the adults believe that the Winter Sun Festival president has been the victim of a tragic accident – a giant dancing animatronic S’more on a parade float has swung down and killed Mr. Steptoe. So you have this really really silly situation but also this tragic accident and that gives that distance and silliness that makes it kind of okay. And also it’s maybe a bit silly that the kids think that this could possibly be murder. Right? As the kids say, seriously? murder by marshmallow? … By giving that distance it helps explore a dark er side. GRWR: How hard was it to put your red herrings into your story because there are a bunch of them? KK: Thank you for recognizing that! The Wig in the Window was not hard, because well, it was hard to write for other reasons, but there’s always something, right? But mystery-wise it’s much more of a thriller, like a psychological thriller for middle schoolers where [the questions are] is this person bad, or is my imagination running away with me or not? So that’s a very simple structure, really. The Tiara in the Terrace is much more like an Agatha Christie novel or a typical cozy mystery as they call it, where you have many suspects in a large cast. It was really hard to trickle in all the clues at the same time that we’re exploring all the social dynamics in friendships. I think as you’re reading you can think oh, gosh, here we have some sort of detour, some sort of social friend detour and you don’t realize oh, wow, all the clues are being laid out at the same time. And so it’s kind of hard pacing-wise to keep the tension going at the same time, your reader might not realize that all of those red herrings are being placed in that sense. It takes a lot of outlining and even reverse outlining. Really knowing the crime, if there is a crime. GRWR: You totally got me … I love being tricked! KK: And I love tricking people. I think in this one you might know who it is but you might not know why. And then all the why is very, I think, very satisfying and very fun. (Ronna talking). One thing I know about kids is they often don’t just read a book once unlike adults and so it’s very important to me to make sure that everything matches up. That if you’re going to read this again, you’re going to see everything a second time and have just as much fun figuring out how it’s constructed as the reading itself. Also, my favorite scene is the parade scene at the end which of course has to be bombastic and spectacular and I really had the most fun writing that. GRWR: Do you ever find, when you hear from young readers, that they’re inspired to write their own mysteries after reading yours? Afterall it is inspiring to see these three young girls go about solving mysteries in their own communities. KK: Oh definitely … I also run some workshops in writing mysteries so I get kids going that way as well. Last summer I was at The James Thurber House in Ohio and they have a summer writing camp and they also go out in the community. All the kids would love trying to create their own mysteries after reading so I had a great time teaching those workshops. I think kids love the idea of uncovering secrets, I mean we all do, but particularly adult secrets because they don’t have full access to that world. It’s fun to imagine what could be happening in worlds they don’t know about. GRWR: Will the girls be back for another adventure? KK: Each book was separate. I like that a lot because they stand alone. If you read carefully there might be mild spoilers that you probably wouldn’t remember but each of those books can stand by itself so I didn’t sell The Wig in the Window as a series. 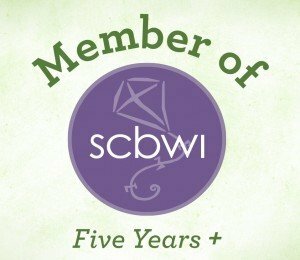 GRWR: So your publisher came back to you after book #1? KK: Right. So that’s a good transition to say, ” Buy The Tiara on the Terrace, everybody, so there can be a third Young and Yang adventure. GRWR: Can you speak briefly about the TV show that’s been optioned? KK: Yeah, I’m really excited that both books have been optioned by a producer and I’m co-writing the first season – the pilot right now. It’s really exciting to be able to imagine giving Young and Yang new life in this form because they can be much more equally represented. You know, both The Wig in the Window and The Tiara in the Terrace are from Sophie Young’s point of view. Now we can step back and look at these families from the outside a little bit and also get much more access to Grace Yang’s point of view and possibly the worlds of the villains. So I’m having a really good time figuring out how to adapt the story and getting a lot of help with it as well. The first season is The Wig and the Window stretched out over 12 episodes so you almost have strangely more opportunity to see more elements of their school life and family life within that kind of episodic structure as opposed to the three act structure of a book. So The Wig in the Window the ongoing mystery travels over the course of the season, but each episode has its own exploration of things that are going on between Young and Yang and their families and school and love interests. GRWR: Did I leave anything out that you would like to add? 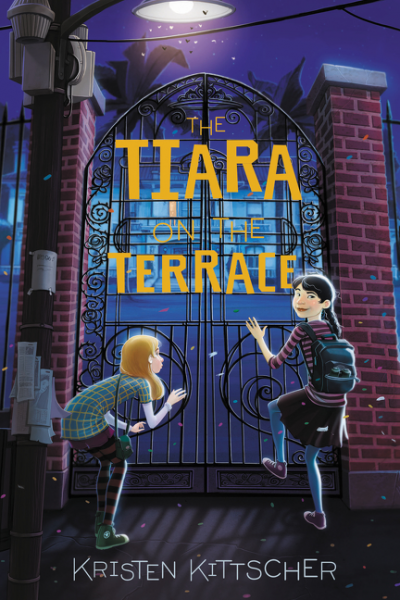 KK: I don’t know if I can think of a direct question but something I really like to get across about why I write in general and especially The Wig in the Window and The Tiara on the Terrace is that I love giving kids a sense of adventure and wonder. In my observations as a teacher, kids can be like little business people these days. They have their rolling back packs and their schedules they have their playdates, they have their extra-curriculars. And their world is very constricted much more so then mine was growing up, and I feel that through books or through these adventures you can kind of restore that sense of wonder but also the feeling that kids can have real power and trust themselves to go on all kinds of fun adventures so I like opening that up to them through books and that’s something that I don’t get asked about much but I love to get across. That books have this power to open up some avenues of freedom for kids in their otherwise sometimes overly scheduled world. 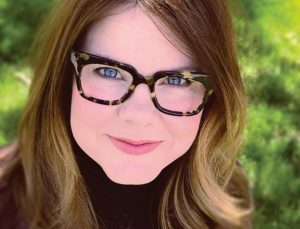 KRISTEN KITTSCHER is the author of bestselling tween mystery The Wig in the Window (Harper Children’s, 2013) which garnered a starred review from School Library Journal and was on ten Best of the Year lists. 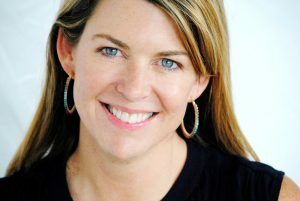 A graduate of Brown University and a former middle school English teacher, Kristen was named the James Thurber House Children’s Writer-in-Residence in 2014. She lives with her husband in Pasadena, home of the Rose Parade—the inspiration for her latest novel, The Tiara on the Terrace. Visit kristenkittscher.com or follow her on Facebook and Twitter (@kkittscher). 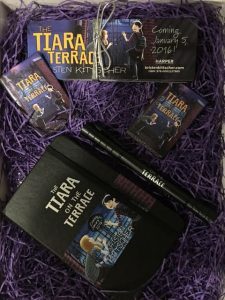 Enter below to win a copy of The Tiara on the Terrace by Kristen Kittscher plus an exclusive spy kit with Moleskine notebook. spy pen, magnets and book marks. Receive an extra entry for following Good Reads With Ronna on Facebook. 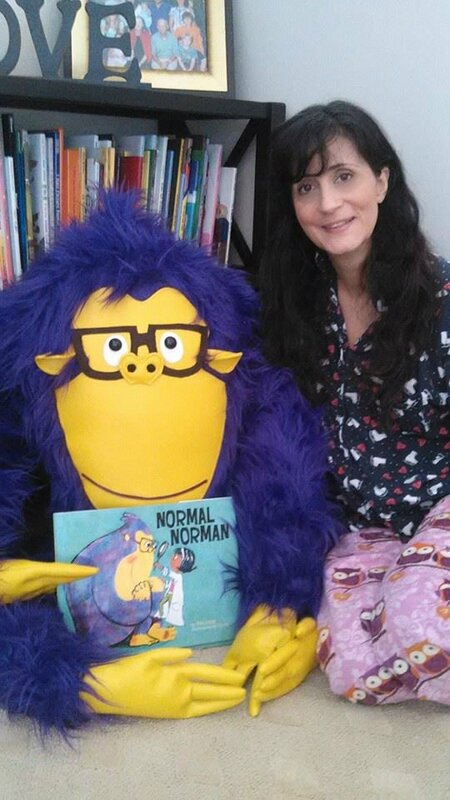 Normal Norman author Tara Lazar alongside the personable, purple orangutan. Photo courtesy of Autumn Lazar ©2016. I don’t dress like a 40-something, either. I know that What-Not-to-Wear show cautions against mini-skirts, Mickey Mouse sweatshirts and combat boots—especially all at the same time—but I don’t care. Since I don’t walk very well, I’ve got a mobility scooter. I painted flames on it. Its max speed is 5mph, so the flames make me feel as close to being Danica Patrick as I’m gonna get. I hate coffee, and I’m a writer. How weird is that? And, what’s even worse, I don’t care for chocolate. If you offered me a dish of ice cream or a plate of cheese, I’d cut the cheese every time. Yes, I just made a fart joke. And I think it’s hysterical. I told you, I’m not normal. And that’s precisely the way I like it. Being normal is overrated. But when you’re a kid? Being normal is EVERYTHING! The slightest cowlick and you’re branded a nerd, a weirdo, a wackadoo. Wear glasses? Geek! Don’t even get me started on being pegged as the teacher’s pet! That was me all through my school years. I was taunted and teased, and one girl bullied me from 2nd grade all the way to senior year in high school. I didn’t dress normally enough or act normally enough for her. I’ve tried to figure out why kids want everyone around them to conform. Maybe things are more predictable and safe that way. There’s nothing to be frightened about. Nothing will jump out suddenly, like a jack-in-the-box. You stay in your corner and I’ll remain in mine and we’ll get through this just fine. I get it. Life is scary. 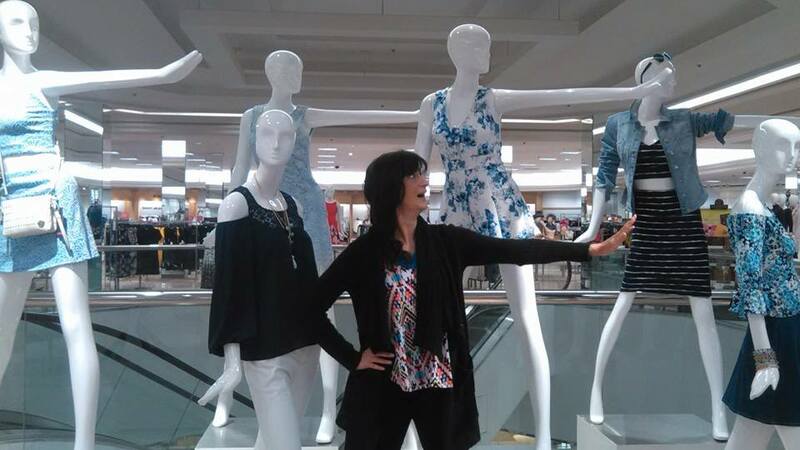 Tara Lazar doing her best mannequin-style Stop In The Name of Love. But my mission in life is to make everything fun. If that means stopping in the name of love to snap a photo with mannequins at the mall, so be it. And if it embarrasses my 12-year-old, let her turn red. Let her see that things shouldn’t be so serious all the time. Let her learn to find joy in the most miniscule things–or a medley of 6-foot plaster mannequins. When I wrote Normal Norman, I didn’t necessarily set out to write some grand statement about all this. I just wanted Norman to be funny and to have fun. What emerged was a character who did just as he pleased and loved every minute of it. What emerged, I suppose, is me—in purple orangutan form! 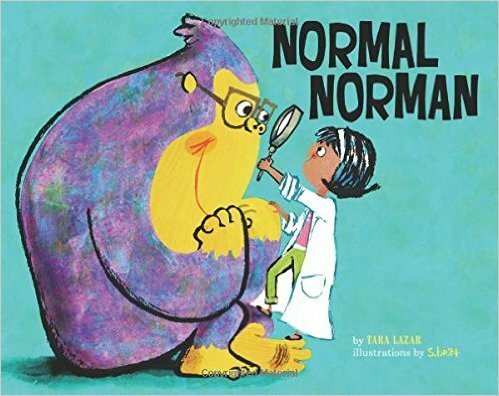 Reprinted with permission from Normal Norman © 2016 by Tara Lazar, Sterling Children’s Books, an imprint of Sterling Publishing Co., Inc. Illustrations © 2016 by Stephan Britt. 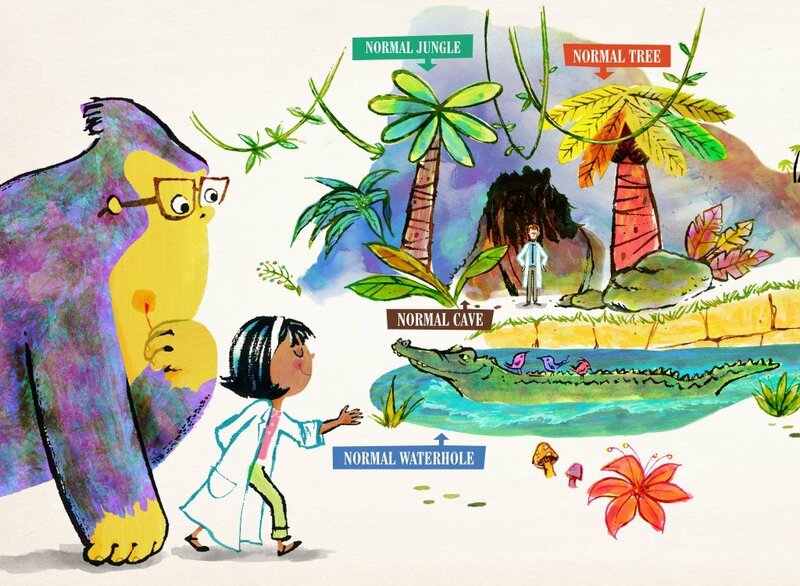 The message to children, buried beneath the hilarity, is that there’s really no such thing as “normal”. With all of us being so different, how could there be only one “normal” expectation to live up to? The real normalness is being your true, normal self, in all its wonderful wackiness. Just like Norman…and me! 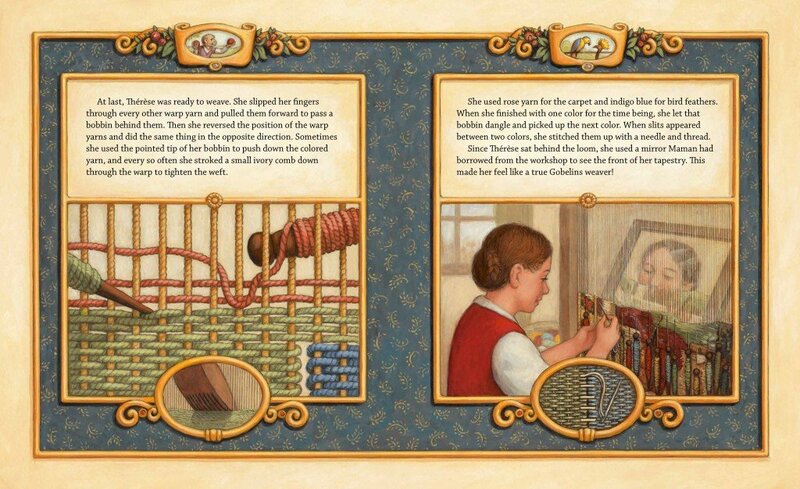 Interior artwork from Oskar and the Eight Blessings by Richard Simon and Tanya Simon with illustrations by Mark Siegel, Roaring Brook Press, ©2015. “Oskar’s mother and father believed in the power of blessings. So did Oskar …” and so begins this poignant picture book with four square sepia toned panels showing the Hanukkah Menorah being lit. Yet with the turn of a page, and the colors going black, the family huddling in fear, synagogues are burnt, the storefront windows of Jewish businesses are broken and life as Oskar and his family knew it was forever changed. Oskar and the Eight Blessings focuses on Oskar as a refugee, only the year is 1938 not 2015. He’s come to America, sent by his fearful parents, immediately following Night of the Broken Glass (Kristallnacht), when it became clear that all Jewish people in Nazi Germany were in grave danger. Landing in New York City, with only the name and photo of his Aunt Esther, Oskar must navigate the cold, big city by himself and make his way 100 blocks up Broadway from the pier in Lower Manhattan. 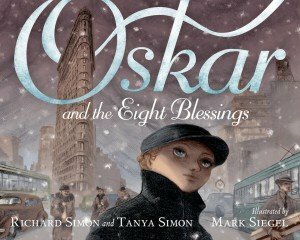 Not only is Oskar and the Eight Blessings a unique and engaging Hanukkah book, so is the way this book is presented. Unlike typical picture books with a title page followed by the story, this tale unfolds with the awful events precipitating Oskar’s departure, and the title page then becomes part of a two-page spread featuring the city’s dramatic skyline as Oskar’s ship pulls into port. 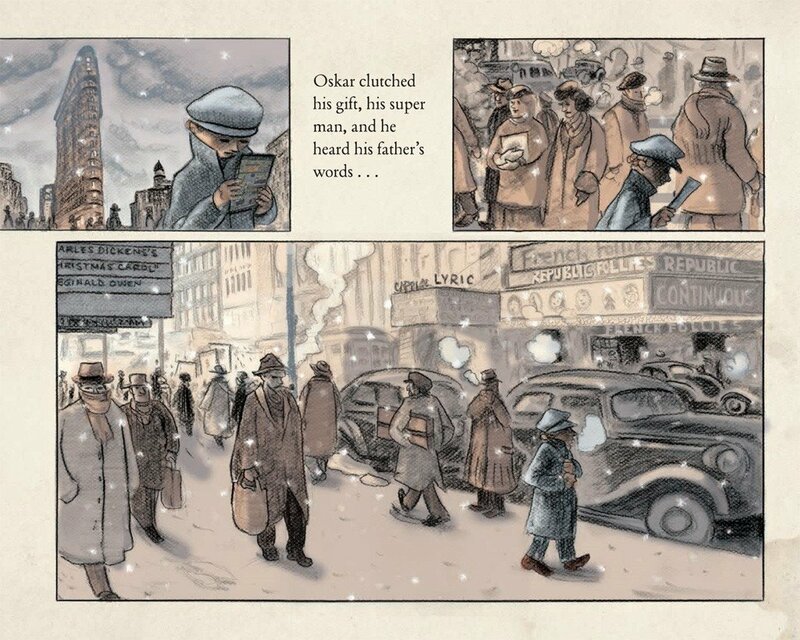 It’s not just the seventh night of Hanukkah as Oskar heads uptown, “it was also Christmas Eve.” The first blessing Oskar receives is from a woman feeding pigeons. Sensing his hunger, she offers Oskar a small loaf of bread. This sustenance helps him carry on so that he can reach Aunt Esther before sundown when the Hanukkah candles would be lit. 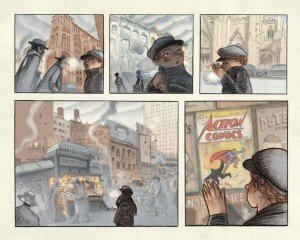 Along Oskar’s journey, he encounters New Yorkers and others (Eleanor Roosevelt) who bestow upon Oskar another six random acts of kindness that tie into that time period and more importantly, that feed his soul and keep him going until he’s walked all the way to Aunt Esther’s, the eighth blessing. Back matter includes an informative Author’s Note, a glossary, as well as a map showing Oskar’s stops on his long day’s trek. I’m so glad I can share this uplifting Hanukkah story filled with evocative scenes and moving text, and use it as a jumping off point to reflect with my family on our blessings this holiday season. The Parakeet Named Dreidel by Isaac Bashevis Singer with illustrations by Suzanne Raphael Berkson, Farrar, Straus and Giroux (BYR) ©2015. 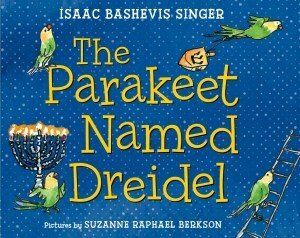 Beloved storyteller and Nobel Prize winner, Isaac Bashevis Singer’s tale of The Parakeet Named Dreidel is brought to life by debut picture book illustrator, Suzanne Raphael Berkson. 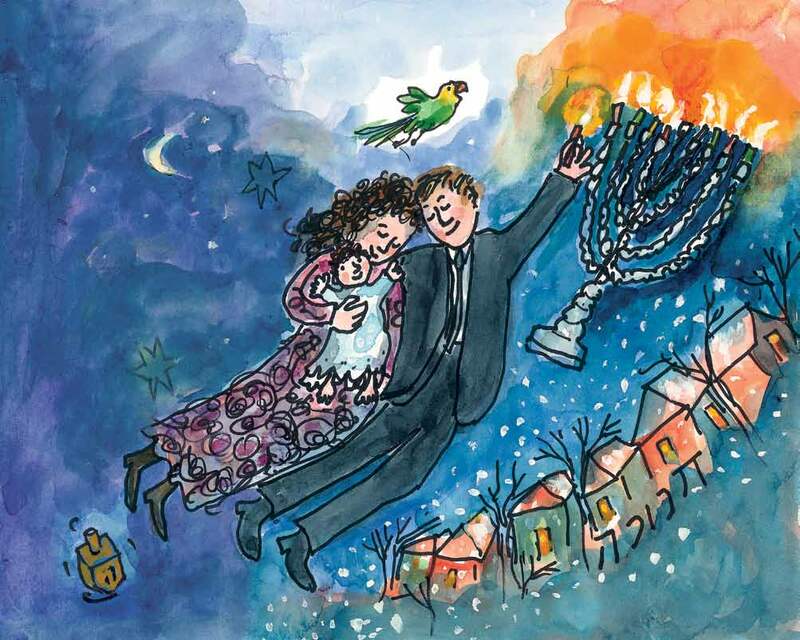 In its latest iteration, The Parakeet Named Dreidel, perhaps the best known from Singer’s Hanukkah collection of stories from The Power of Light, with page after page of joyful watercolor illustrations, seems ideal for a new generation of readers. This heartwarming tale of lost and found and love never fails to bring a smile to my face. 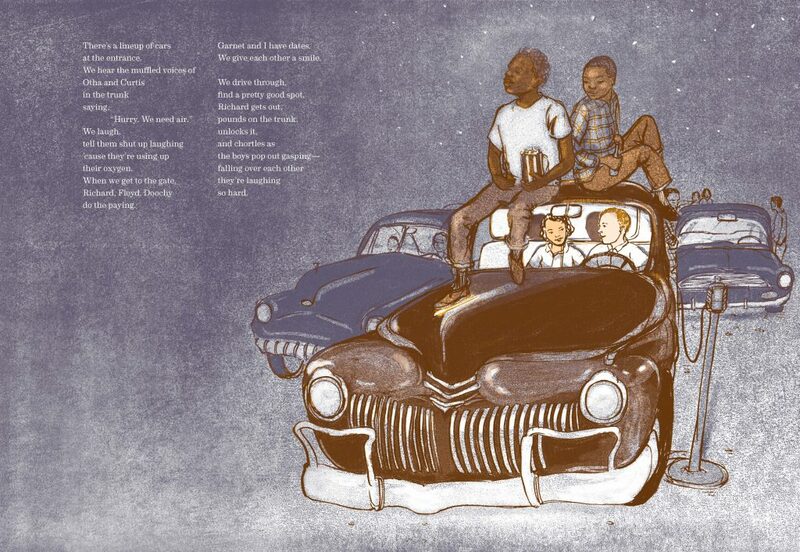 In this picture book, the narrator Singer is recounting a tale from ten years earlier when he was looking out the frost covered window with his son, David. 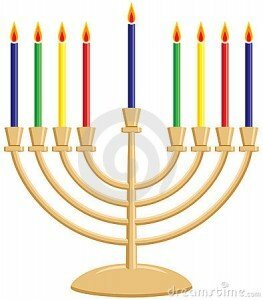 It was the eighth day of Hanukkah and the Menorah burned brightly on their windowsill. During a game of dreidel, David discovered a parakeet on the ledge outside the window “perhaps attracted by the light.” This casually recollected tale, though actually carefully constructed to keep us turning the pages, takes us through that eventful evening after Singer and son David encouraged the parakeet to come inside from the cold. This yellow-green bird appeared trained and could even play dreidel by pushing the wooden top with its beak, so surely someone had lost and must be missing it. Because of its game playing skills, David named the parakeet Dreidel, but set out with his dad the next day to find its owner. The most revealing trait of Dreidel’s was his ability to speak Yiddish! On occasion, the family heard the parakeet say, “Zeldele, geh schlofen” (Zeldele, go to sleep). Yet despite his uniqueness, the parakeet went unclaimed. Nine years went by and we see, through Raphael Berkson’s playful art, that Dreidel has grown to be a member of the Singer family, often sitting alongside the author as he typed. By this point, David has become a college student and, as fate would have it, attended a party where, while telling the story of Dreidel, he happened to meet the actual Zelda of whom Dreidel had long ago spoken. She was Zeldele, the original owner. The two college students soon became a couple, Zelda was reunited with her long lost pet, and Dreidel was credited with bringing the pair together. My favorite illustration is the Chagall-like one included here that depicts the loving young couple as jubilant new parents floating amongst all the significant items in their relationship. 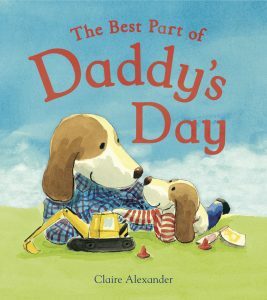 This book brought home the serendipity of life and the love a pet can bring into a family’s home. Raphael Berkson has selected a wonderful story to show off her talent and make me look forward to seeing more of her work in the future. 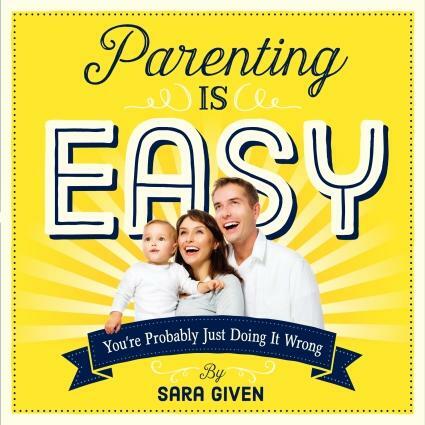 Parenting is Easy by Sara Given Plus a Giveaway! Parenting is Easy: You’re Probably Just Doing it Wrong is one of those books you need to keep on hand to lift your spirits when you feel you’ve been doing too much laundry, chauffeuring too many kids, or cleaning up too many messes. It’s certain to bring loads of smiles and laugh out loud moments this holiday season (and year round) to lots of people on your gift list. And, at a little over 6″ x 6″ in size, it’ll easily stuff into stockings or make a delightful diaper cake topper for any baby shower! That’s if you don’t throw it at someone looking a little too well-dressed, a little too composed or a little too, well, perfect, first!! 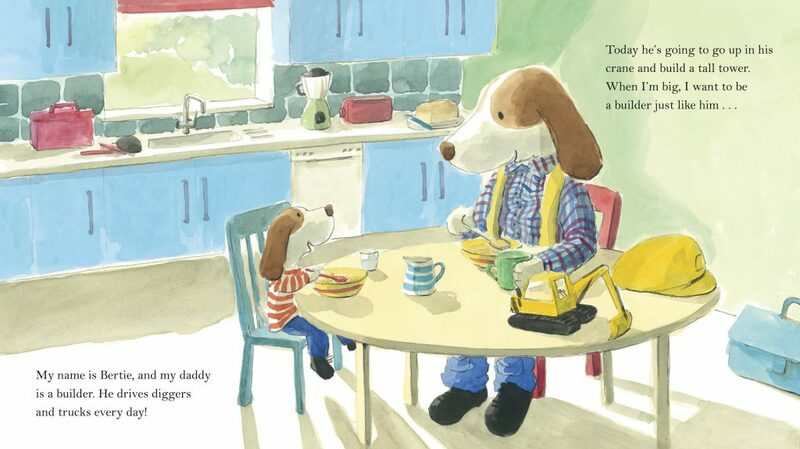 Interior image from PARENTING IS EASY by Sara Given, Workman Publishing ©2015. … I knew I had a winner in my hands. And the best part was sitting down alongside my husband seeing who could find THE picture that showed a parenting situation that could no way, shape or form ever occur on this planet. His pick – the one of a boy choosing to eat a healthy after school snack and hang out with his mom over playing Xbox with his buddy, Isaac. I mean, wouldn’t your child do the same? I also enjoyed how Given cleverly included one or two page guides for each chapter such as Chapter One’s Eating Healthily While Pregnant with kale being in both the Eat and Avoid columns! In Chapter Two Given answers the age old question Why Isn’t Baby Sleeping? We learn what could be keeping baby up at night is anxiety over the skyrocketing cost of college tuition. There’s also handy breast-feeding info, Dealing With Common Toddler Behaviors, advice on Mediating Conflicts With Your Teen and lots more. So if spending time hearing about everyone’s marvelous life on Facebook has got you pulling out hair, check out the smiley, happy people in Given’s book for a good, honest laugh because her captions are brilliant and her take on perfection includes countless references to white carpet, clothing and furniture which never failed to crack me up. Enter now for your chance to win a copy and buy extra books to give friends. See for yourself just how right Given gets it and then let me know which pictures and captions were your faves. ENTER OUR GIVEAWAY: WIN 1 COPY OF SARA GIVEN’S NEW BOOK!! Plus, if you follow us on Facebook and let us know in the comments below, we’ll give you an extra entry. Follow us on Instagram and get an additional entry, too. Good luck! 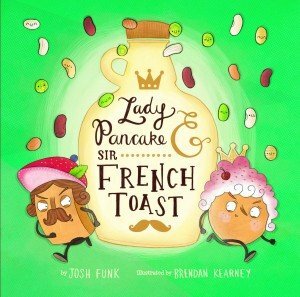 Before even reading it, I knew that Josh Funk’s debut picture book, Lady Pancake & Sir French Toast, was going to be a sweet treat, but I had no idea just how many belly laughs it would elicit. To be honest, while I may have initially favored Sir French Toast, my breakfast food partiality in no way influenced my opinion of Funk’s book whatsoever. In fact, I’m actually a von Waffle girl myself. 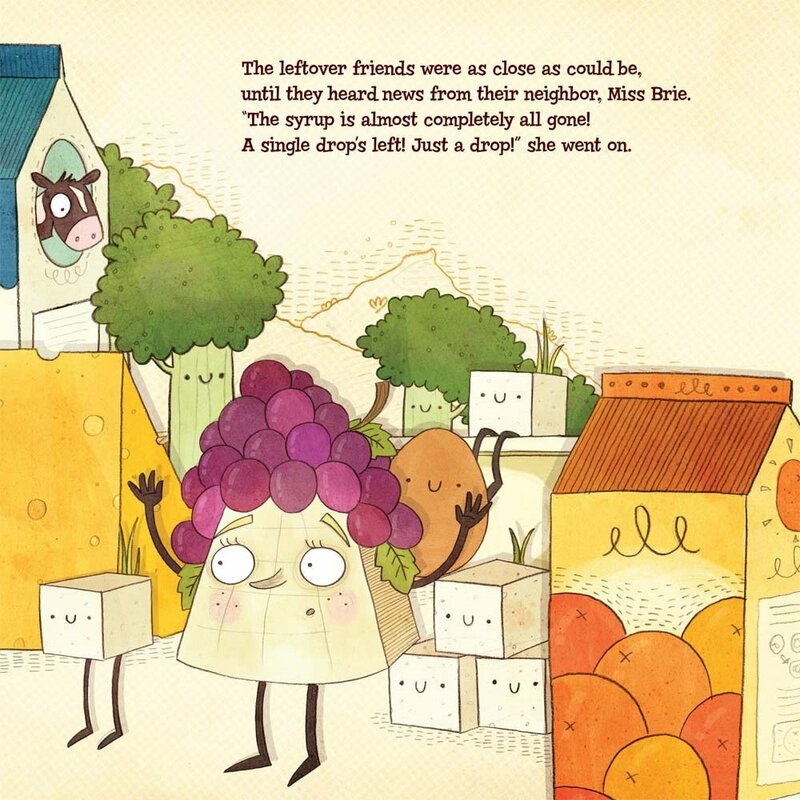 Interior artwork from Lady Pancake & Sir French Toast by Josh Funk with illustrations by Brendan Kearney, Sterling Children’s Books ©2015. When word comes down from up high that “The syrup is almost completely gone!’ Miss Brie produces panic in the breakfast food buddies. Before you can say “Genuine Maple,” the good Lady P and her pal, Sir FT, are off, determined to beat the other to the last remaining drop. Funk tickles our taste buds as he takes us on an amazing race up, down, and all around the fridge in an appetizing adventure that includes pushing and shoving, plummeting and hurdling, often at breakneck pace, to reach the syrup. There are simply too may funny food scenes to describe, but suffice it to say Funk’s text provided Kearney with a field day for whimsical illustrations. My favorites are the bean avalanche and the surprise fold out fridge interior at the book’s end, providing your littlest foodie with a chance to closely examine all the contents shelf by shelf. 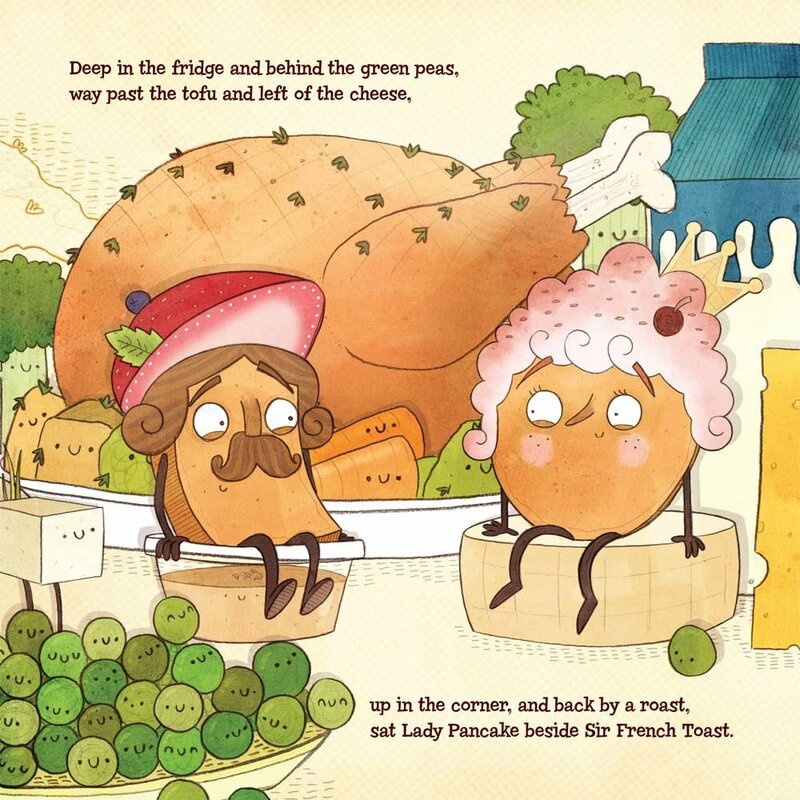 Lady Pancake & Sir French Toast is not only a rollicking, rhyming read aloud full of colorful fun, but if you’re a Foley (sound effects) fan, here’s your chance to try out your PLOPS!, FLIPS! and THUMPS! to your heart’s content. There’s even an avalanche to test your mettle! Readers young and old will enjoy the wonderful twist to this tale that caught me off and pinned another huge grin on my already happy face. If this book doesn’t leave everyone completely satisfied and sunny side up, I don’t know what will! WIN 1 COPY OF JOSH FUNK’S NEW BOOK!! Plus, if you follow us on Facebook and let us know in the comments below, we’ll give you an extra entry. An additional comment on our Facebook post for this picture book gets you yet another entry. Good luck! 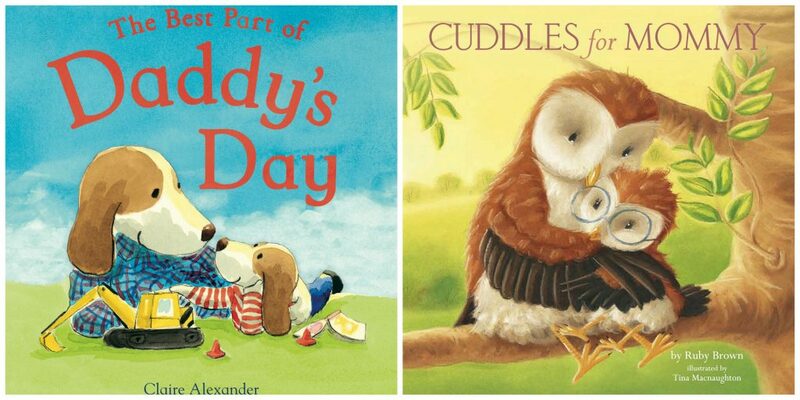 It’s Day 2 of this terrific picture book blog tour. And for parents who need a way to get their little ones off to the land of nod, we’re guessing the timing couldn’t be better! How do you respond to hearing those words at bedtime, especially if you know it’s not procrastination, but more a case of simply not wanting a wonderful day to end? It’s difficult because we all at one time or another have experienced that hyped-up, can’t turn my brain off feeling just like our kids. 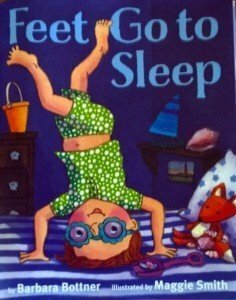 Feet, Go to Sleep by Barbara Bottner is the perfect read aloud picture book response to these occasional protestations. But frankly, it’s also a lot more. Reading Feet, Go to Sleep is an original way to teach children a popular relaxation technique (referred to in yesterday’s post as Savasana) for winding down to ensure a speedy visit to dreamland. 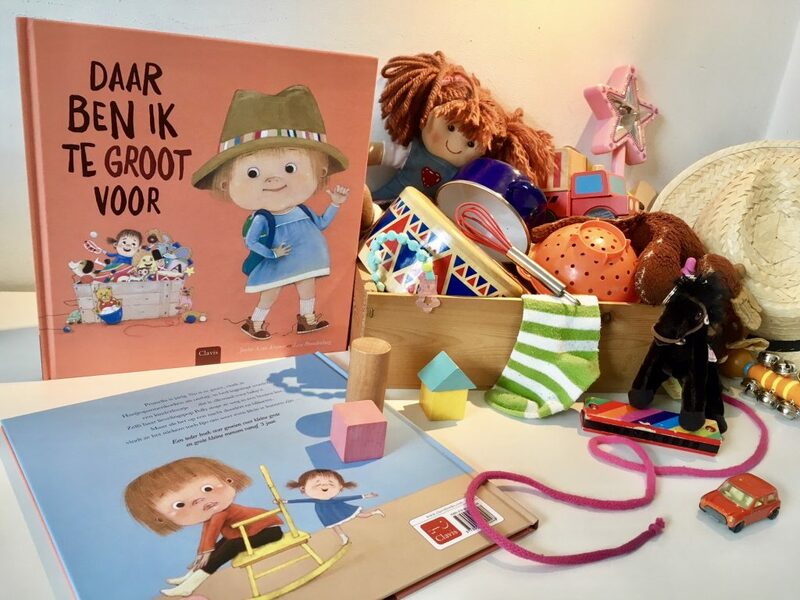 Along the way, children can practice the process of putting each part of their body to sleep just like Fiona, the book’s main character, while recounting their day’s events either to their parents or to themselves. Toes were easy. They went right to sleep. Interior artwork from Feet, Go To Sleep by Barbara Bottner with illustrations by Maggie Smith, Knopf Books for Young Readers, ©2015. them one last roll before they lay still. Shoulders were for rubbing with sunscreen. Playing carries on with a beach ball toss, followed by an outdoor shower back at home and then a barbeque at dusk, and bedtime. But can Fiona fall asleep when she’s tuned in to grown up voices chatting outside her open window? Smith’s spot on illustrations have captured all the action and joy of a sunshiny day at the beach, so much so that you’ll find yourself ready to grab the sun block and join the group. 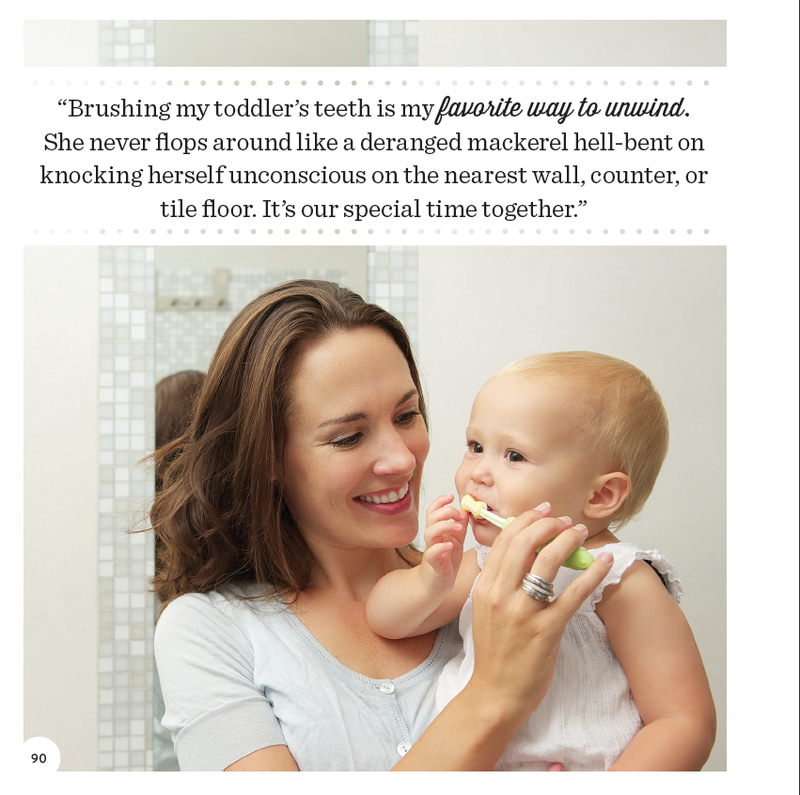 And the blues she uses for her bedtime spreads are soothing and slumber-inducing. “Eyes, go to sleep,” whispered Fiona. If my kids were still young, I’d welcome the chance to introduce this powerful, yet peaceful way of releasing tension from their bodies, that’s cleverly wrapped inside an ebullient beach day bedtime story. Check out all the great bloggers on this tour to get a variety of perspectives on Feet, Go To Sleep. AN EXCLUSIVE GIVEAWAY! See below. Plus, if you follow us on Facebook and let us know in the comments below, we’ll give you an extra entry. An additional comment on our Facebook post for this blog tour gets you yet another entry. Good luck!